Office Hours: Tuesdays, 10:00 – 11:00 a.m. Please contact Megan for information pertaining to member payment, MSUSCMA Paypal and Venmo, and reimbursement. Hi everyone! 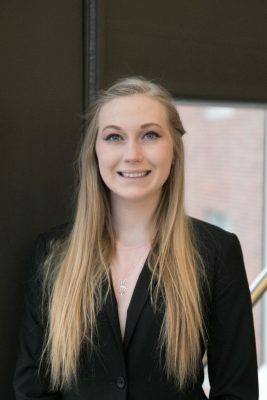 My name is Megan Reimel and I am a Junior, studying Supply Chain Management with an Entrepreneurship and Innovation minor focused in Social Innovation. I am beyond excited to have the privilege of stepping into this year’s Treasurer role on SCMA’s Executive Board. Ever since my freshman year, the Supply Chain Management Association has been one of the most influential pieces on my professional career. It has helped create professional skills from the basics, to networking with a multitude of recruiters, nation-wide. This past summer, I had the opportunity to intern for Nypro, a healthcare manufacturing company, in their Supply Chain department. Here, I worked in numerous areas, such as warehousing, purchasing, planning, and operations. Over the course of this internship I learned numerous valuable skills that will stay with me for years to come. During the summer of 2018, I will be interning with Baxter Healthcare in their Operations Development Program. Here, I will have the opportunity to work on projects related to process mapping, process creation, and process improvement within plant and warehouse operations. I highly encourage anyone interested in any business major to join SCMA and learn more about potential career paths, opportunities, and experiences this organization and supply chain management have to offer. Through this organization you will have the opportunity to network, meet recruiters from companies in countless industries, and meet life-long friends. If you have any questions regarding, resumes, cover letters, internships, or my role as treasurer please do not hesitate to reach out! Go Green!